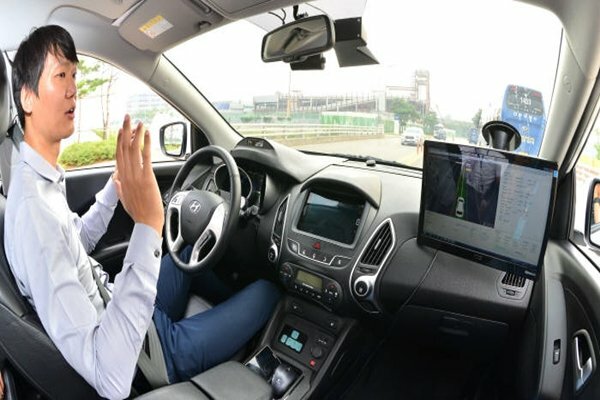 Hyundai Motor Company is planning to introduce ‘HDA2 (Highway Driving Assist)’, which has semi-self-driving functions, one year earlier than its initial plan as global automotive manufacturers such as Cadillac and Audi are starting to apply self-driving technologies to their cars early. According to Hyundai Motor Company on the 16th, HDA2, which is supposed to be commercialized between 2019 and 2020, is going to be applied to its cars at the end of next year at the earliest. Although it has not yet to decide on which of its cars is going to be applied with HDA2, it is likely that it will apply HDA2 to Genesis brand first and start applying HDA2 to other brands in order. HDA2 is an improved version of ‘HDA’ which almost allows cars to be driven autonomously on freeways. HDA is a technology that is combined with ASCC (Advanced Smart Cruise Control), LKAS, (Lane Keeping Assist System), and navigation information and it supports safe drive by maintaining distance between cars and lanes, automatically stopping when a car in front stops, and regulating speed under speed limit. However drivers have to manually control their cars when they change crossroads or enter junctions. HDA2 changes a crossroad, enters a junction, and goes on a main road on its own if a driver just turns on a signal while he or she is driving on a freeway. It allows a swift response and automatically controls speed when a car suddenly cuts in front as it equips additional radars in the front and the sides. With these sensors, HDA2 prevents sudden breaks if sensors cannot detect surrounding during drives. While current HAD can only detect the front and the back of a car, HDA2 can detect every areas due to increased number of sensors. Reason why Hyundai Motor Company is planning to commercialize HDA2 early is because level 3 self-driving technologies are going to be commercialized on full-scale starting from this fall. Cadillac ‘CT6’, which will be released this fall, will be the first car to be equipped with level 3 self-driving technology called ‘Super Cruise’. Audi is going to apply level 3 self-driving technology called ‘AI TJP (Artificial Intelligence Traffic Jam Pilot), which is co-developed with NVIDIA, to its new ‘A8’. Mercedes-Benz is also planning to apply level 3 self-driving technology to its new cars in 2018. According to KAMA (Korea Automobile Manufacturers Association) and KAIDA (Korea Automobile Importers & Distributors Association), 25 different cars that are currently being sold in South Korea have semi-self-driving technologies that correspond to level 2 self-driving technology. Level 2 is based on ADAS (Advanced Driving Assist System) and allows autonomous driving during limited time and within limited space. However one cannot let go of a steering wheel and also has to keep his or eyes focused at the front. On the other hand, level 3 partially allows autonomous driving and it allows drivers to let go of their hands and feet and not to focus on their driving when they are driving on freeways. Drivers have to manually control their handles and brakes when there is a dangerous situation or face situations when autonomous driving is impossible. Experts are predicting that if Hyundai Motor Company commercializes HDA2 in 2018, it will be able to improve its technical skills in self-driving technology, which are seen somewhat lacking compared to other leading automotive manufacturers, by one step or more. According to an American market research company called ‘Navigant Research’, Ford currently has the most advanced self-driving technologies and Hyundai Motor Company is placed within top 10 based on level of self-driving technologies it has.